Marie and Luis like to create projects that benefit the people around them as well as Motherearth. These include reforestation with native species, forest conservation, solar energy, a woodshop for women in rural communities and support for traditional midwives throughout Central America. With a diversified landscape, rich bio-diversity and accessibility, this highly productive farm is located in San Carlos, 160 Kilometers north of San José, in a very humid tropical climatic zone, ideal for fast-growing forests. 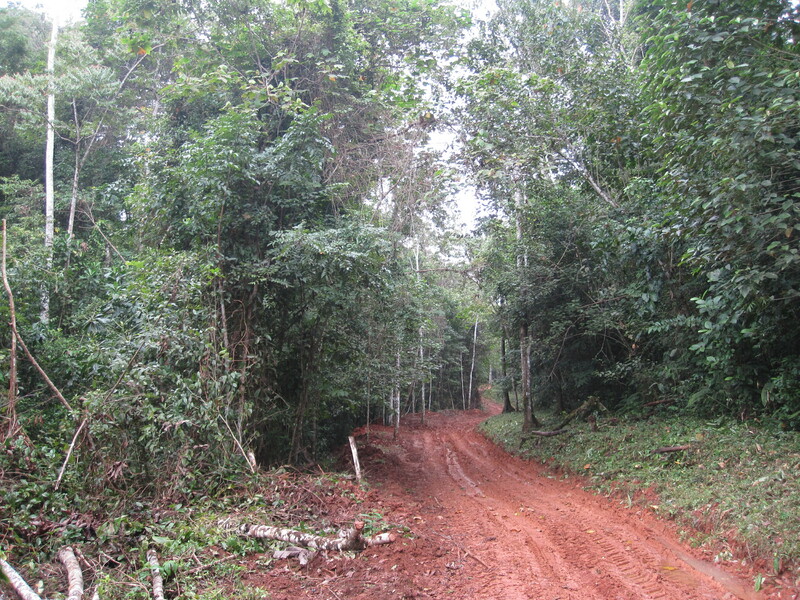 The Northern lowlands area around San Carlos is the very best location for timber and many types of agricultural production. *****Farms in the region as of this year (2018) are selling for $6,000 USD per hectare. 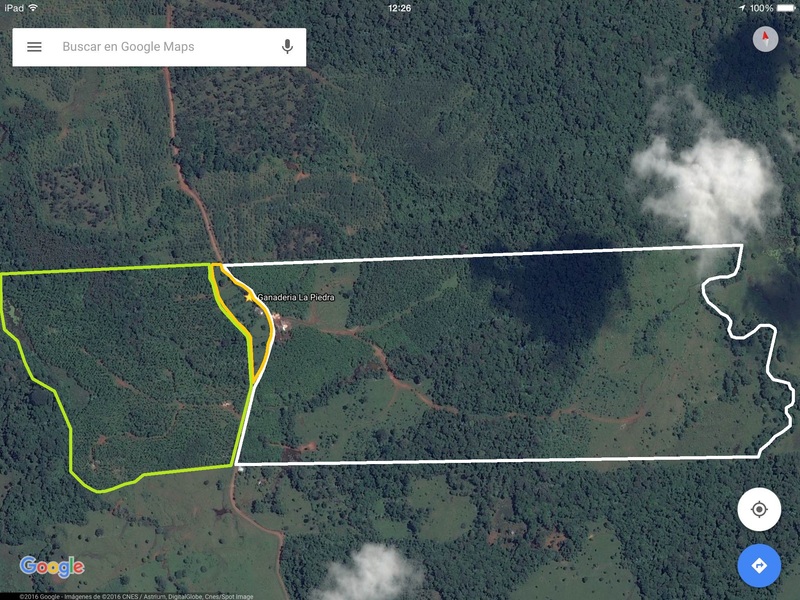 Our farm is priced to sell at $4000.00 USD per hectare, 33% below current market prices. 1. 15 Hectares of timber plantations, species include… Vochysia guatemalensis (11 hectares), vochysia ferruginea (2 hectares), terminalia amazonia (2 hectares). 2. 36 Hectares of natural forest where many massive primary growth trees and animal life can be found, including Great Green Macaws living and feeding of ancient Almendro trees, and jaguars. 3. 5 hectares are protected wetlands. 4. Three hectares are dedicated to industrial production, cattle ranches and living quarters for the workers. The 15 hectares of native wood trees have a production potential of 2,000 cubic meters of wood, ready for harvesting during the years 2018 through 2020. The farm has electricity and good cell phone reception. The closest town is 6 kilometers away and it has a school, a small supermarket and a hardware store. Forestry is fast becoming popular with investors for many reasons. Timber is the only asset class to have risen during 3 out of the last 4 economic downturns. As the world’s population rises, so does the demand for timber. But, as the world’s population puts a strain on natural resources, it makes sense to invest responsibly in sustainable High Return Eco-Investments. The native tree species were chosen for their adaptability to the local climatic conditions and also because they are fast growing. 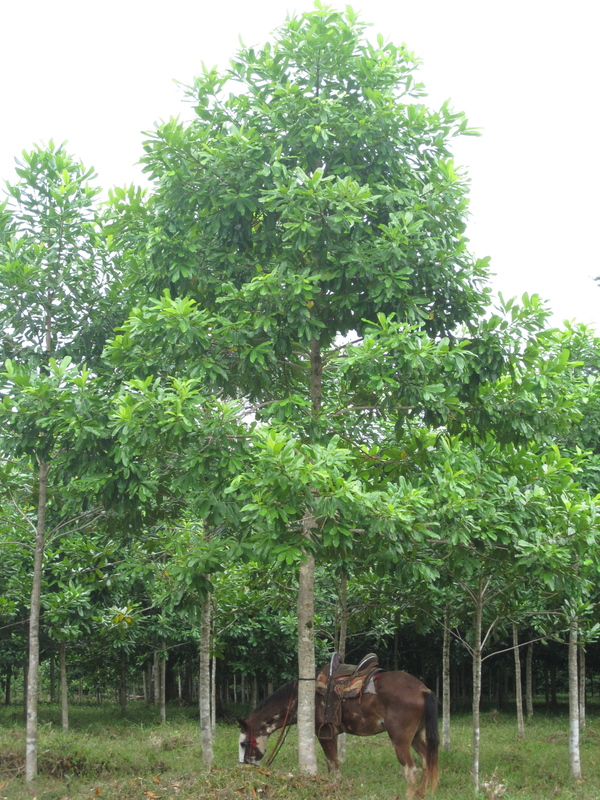 Vochysia guatemalensis is a medium to large tree, 30-55 m tall with diameter of 0.5-1.5 m. It is known locally as Cebo or cedro rosado, and the trade name is white mahogany. The vochysia ferruginea and guatemalensis have the nickname of botarrama, or branch dropper, because of their habit of dropping their lower branches as they grow, leaving a straight bare trunk, and in this way raise their crowns above the canopy, reaching heights of more than 45 metres. This wood is used in construction in many ways, and these plantations are excellent at sequestering atmospheric carbon dioxide. The United Nations predicts that worldwide demand for timber will double by the middle of this Century. The annual global use of timber is estimated at around 4 billion tonnes (FAO, 2009), equivalent to about three-quarters of a tonne of wood for every human being on earth. With world population increasing by around 3% per year, a corresponding rise in demand for wood is inevitable. Additional pressures to use more wood also come from concerns over the effects of climate change on the environment. Initiatives are rapidly developing to replace construction materials that use large amounts of embedded energy in their manufacture, such as concrete and steel, with ‘low carbon’ timber as a means of mitigating carbon emissions (e.g. Edinburgh Centre for Carbon Management, 2006). However, the most dramatic increase in wood consumption in recent years is through the use of wood as a ‘carbon neutral’ fuel (FAO, 2009). We chose to produce timber but there are many possible uses for this farm…. 1. Cacao plantations: the climatic and topographic conditions of this farm are ideal for cacao. 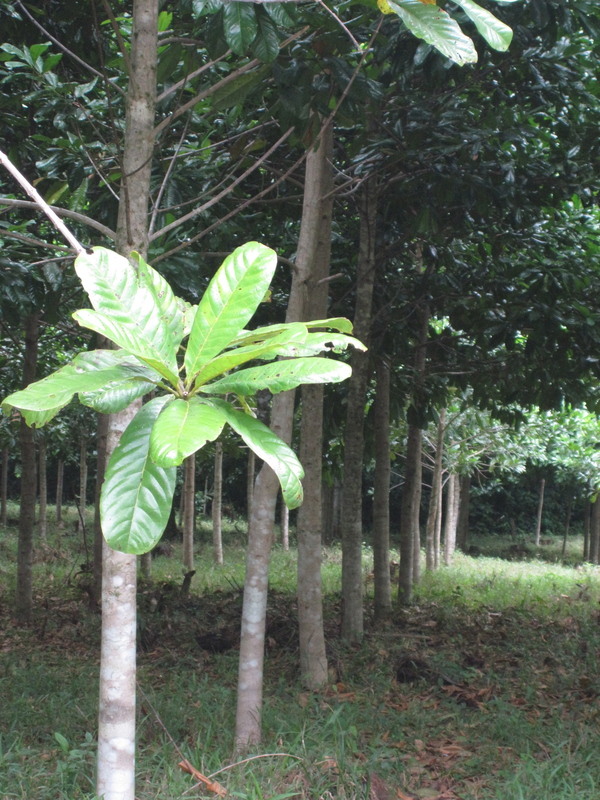 In addition, the plantations provide the perfect shade for cacao trees. 2. Timber production: The climatic and topographic conditions of the farm are ideal for timber plantations. 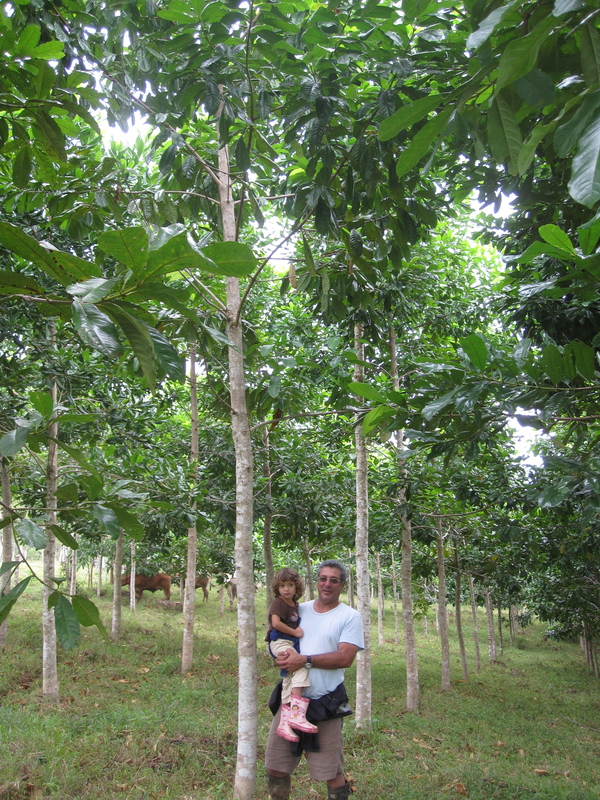 Prior to the native species we’ve planted during the past decade, this farm was used for growing Gmelina trees for 30 years. 3. Rural tourism: The beautiful views, natural rainforest and rivers provide a perfect setting for rural and adventure tourism. 4. Pineapple production: The climatic and topographic conditions of the farm are ideal for pineapple. With the added bonus that there are roads throughout the farm and the road to the farm is adequate for large trucks. 5. African Palm: International prices are high and stable for this commodity, used for cooking oil and bio-diesel for vehicles. The farm is located in Province of Alejuela in the North of Costa Rica, about 3 hours from the Capital San José, and 1.5 hours from the city of Ciudad Quesada. The roads leading to the farm are paved all the way until the last 40 kilometres which are gravel and in good condition. There are also plans for paving the road all the way to the farm in 2017. 4-wheel drive is not needed, any car can get to the farm. Until very recently the farm was accessible by just this one route from San Jose. A newly constructed highway from the North to the Atlantic Coast now connects this farm with many other richly bio-diverse areas that were once inaccessible, and to the port city of Limon. The new highway is called Juan Rafael Mora Porras. The land is flat with hilly areas. The main road divides the farm into two equally large areas and there are roads throughout the farm, making all areas of the farm accessible. The borders of the farm are defined by 2 rivers that can be navigated by kayak or canoe. The wetland areas appear as lakes after a rainstorm and the water level comes down when it stops raining. Some of the reforested areas flood and the native tree species that have been planted there were chosen because of their affinity to flooding. 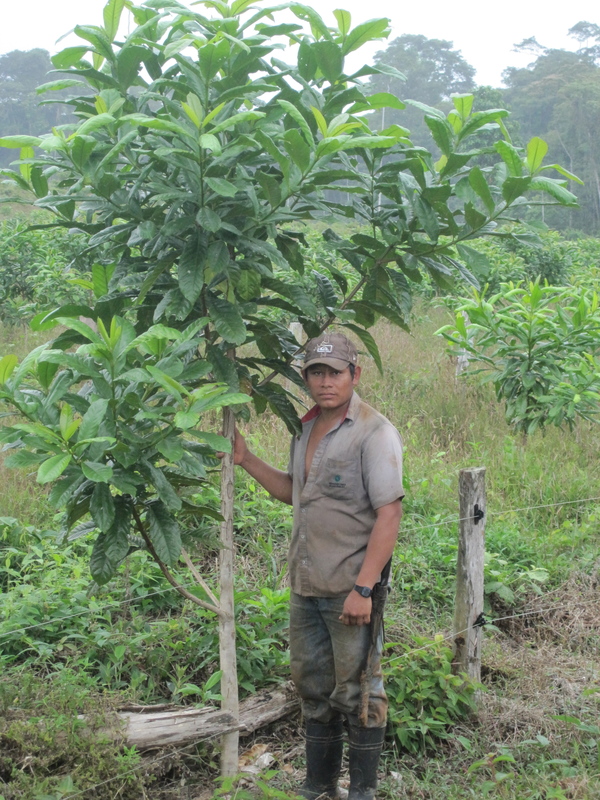 Influenced by the Atlantic climate of Costa Rica, the farm enjoys rain year-round. There are actually 7 months of rain and 5 months of dry season, but showers are common during the dry season too, and annual rainfall is between 4,000 and 6,000 mm. The temperature ranges between 20 and 35 degrees celsius. Costa Rica’s government proposes the country will become first carbon-neutral nation by protecting and expanding its forests and is granting landowners a monthly payment to plant and conserve the trees. 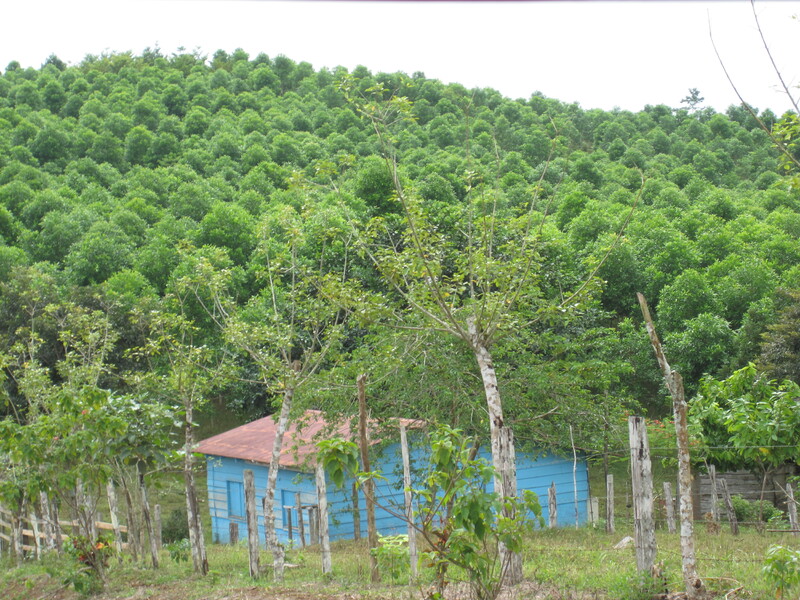 The government agency Fonafifo (www.fonafifo.com) finances the plantations, a payment based on the number of trees planted. The Payment for Environmental Services Program (ESPP) constitutes a financial recognition by the State, through FONAFIFO. This payment is granted to forest and plantation owners for the environmental services they render, which directly affect the protection and improvement of the environment. Costa Rica is one of the few countries that have pledged to be fully carbon neutral before 2030. Traveling through the centre of the polluted Capital San José you would be forgiven for questioning if this pledge really has been put into practice. However, according to the United Nations Costa Rica has a head start; in 2003 the country produced roughly 1.5 tonnes of carbon per person, compared to close to 10 tonnes in Norway, one of the other few countries aiming towards carbon neutrality. Protection of water for urban, rural or hydroelectric purposes. Sustainable, scientific and pharmaceutical uses. Protection of ecosystems and life forms, including natural scenic beauty for tourism and scientific purposes. These funds are donated by diverse sources such as proceeds from taxes on fuel, grants from international banks and aid agencies, and a beer company concerned about water quality. Carbon credits are earned by purchasing land on which trees are growing, over time this land pull carbon from the air to produce wood, which theoretically stays in the rainforest for centuries. Costa Rica is an upper middle-income country with about 4.5 million people and a GDP per capita of $5,800 (2007), It has been one of the most stable democracies in Latin America – with relatively strong public institutions and peaceful transitions of power since 1949. Poverty and inequality are much lower in Costa Rica than the average for Latin America and Central America, and social indicators are generally much stronger than comparable countries in the region and worldwide. Situated between Nicaragua to the north and Panama to the south, Costa Rica has two ocean coasts, the Pacific and the Caribbean. With a land area of only 51,100 km2 (0.03% of the planet´s surface) and 589,000 km2 of territorial waters, Costa Rica is considered to be one of the 20 countries with greatest biodiversity in the world. The +500,000 species found in this small country represent nearly 4% of the total species estimated worldwide (Inbio). It rains almost every day of the year, making it lush and abundant; in this region the minimum annual rainfall is between 1,750 (69 in) and 2,000 millimetres (79 in). Mean monthly temperatures exceed 18 °C (64 °F) throughout the year. A little over 25 % of Costa Rican territory is covered by a protection plan. To complement national efforts to create a legal framework for biodiversity conservation, Costa Rica has signed and ratified various international and regional agreements, including the Convention on Biological Diversity (CBD), the CITES agreement that regulates the trade in endangered species, and the Wetlands or RAMSAR Convention, among many others.